A major point of differentiation between Coronet City and other metropolises--like those of Nar Shaddaa and Coruscant--is the Corellian appreciation for nature. Amid Corellia's towering structures and high speed trams, one can always find a small tree-lined park or quiet reflection pool. Axial Park is the grandest expression of Corellia's desire to remain connected to the natural world. At a cost of over seventy billion credits, Coronet City's civil engineers set aside valuable real estate for the creation of several museums and landmarks separated by beautiful parklands. For some, one of the greatest tragedies of the war is to see such beauty spoiled by bombardment and the park's grand museums converted into bunkers. Droid manufacturing is one of Corellia's most successful industries, with almost ninety thousand droids produced every day in Labor Valley alone. The Beharen Droid Factory specializes in hazardous maintenance units designed specifically for disaster relief and recovery operations; these droid models are built to withstand high radiation, extreme temperatures and falling debris. The founder of the Beharen Droid Factory recently perished during the Empire's attack on Corellia. The high-rise tower containing his residence was clipped by a damaged Imperial warship, collapsing several floors and nearly toppling the structure. The factory founder's body has not yet been recovered from the rubble. Corellia has numerous spaceports, but few as extensive as the Blastfield Shipyards. Before the Imperial invasion, thousands of ships were built or serviced here on a daily basis by hundreds of local businesses. Mercenaries flying in from the Outer Rim to have their ships' engines tuned by a legendary Corellian mechanic would land next to construction yards for enormous luxury yachts catering to the galaxy's wealthiest nobles. Dozens of cantinas and small-scale entertainment districts nearby served the needs of visitors and workers seeking a break from spaceflight or daily labor. Now that war has come to Corellia, the Blastfield Shipyards are the main point of entry for Republic forces, from troop drop ships to battle cruisers in need of repair. The Empire has made numerous attack runs over the sector, leaving scorched starship wreckage and twisted scaffolding scattered through the streets, but the Republic military knows that losing the shipyards means losing Corellia. Every effort must be made to keep them secure. The fighting on Corellia has reached its apex at the planet's seat of political power: the Government District. Republic and Imperial forces wage fierce battles around the heavily-guarded legislature and the famous Drall Library--now a makeshift bunker. Dozens of politicians huddle in their private estates to wait out the fighting even as the fabled Green Jedi mount a desperate defense against Imperial units bent on the rebels' annihilation. 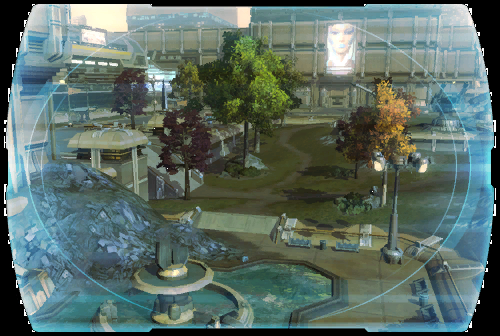 Before the war, the Government District was the grandest part of Corellia--a bright testament to its wealth and freedom. Few suspected the influence of the Empire was taking root within a place of such prosperity, and no one--Imperial or Republic--knows what will become of the district after the war. When the Republic established its beachhead at the Blastfield Shipyards, the Empire was quick to secure Coronet Shipping for itself as a rapid-response staging area. The main ground approach to these landing pads was destroyed by Imperial forces, rendering the area inaccessible to infantry and walker units. Aerial patrols keep Republic assault shuttles at bay and protect the Empire's elite troops. The fabled Coronet Zoo is renowned across the galaxy for its amazing animal exhibits. Every year, nearly extinct species are rescued from forgotten worlds and preserved in multimillion credit wildlife enclosures; the greatest xenozoologists in the Republic vie for a few coveted positions as curators. The Empire's assault on Corellia shattered several enclosure walls and sent alien wildlife running free in the city streets. This has resulted in scenes of great beauty--like the sight of a herd of kybucks proudly galloping down a major promenade--but it has also unleashed terrible predators that now stalk humanoid prey in the steel canyons. Unconfirmed reports of a rancor on the loose remain a hot topic on the comm channels. Darth Decimus, mastermind of the Corellian invasion and leader of the Empire's planetary forces, has established his central command in the former offices of the planet's Trade Tariff Service. Moff Tarandon recommended the building's use on the grounds that its function was now obsolete, and that enemy forces would likely ignore it in favor of attacking the Legislature Building. Darth Decimus wasted no time transforming the former government office into an Imperial fortress. The structure's main entrance is under heavy guard and the only access to Decimus himself is via a single secure turbolift. The few Corellian bureaucrats in the building when Imperial forces arrived either pledged themselves to the planet's new government, or fled their offices via any route possible. The Green Jedi Enclave has been the Empire's top target since invading Corellia, but initial attempts to destroy it failed utterly. The enclave's inhabitants appear to have learned from what happened to the Jedi Temple on Coruscant and taken steps to avoid a similar fate. Powerful shields fueled by internal reactors protected the structure from the first assault, giving the Jedi time to erect offensive cannons. An Imperial warship sent to attack the structure was shot to pieces over the sector, and although a large chunk of the vessel crashed into the enclave, it did not inflict heavy casualties or substantially weaken the structure. The Green Jedi Enclave remains a dark blot on the Empire's otherwise nearly flawless invasion. Corellia's economy is built on free trade, and the major corporate entities established on the planet post trillions of credits in profits each year. The business transactions occurring on Corellia affect every other corner of the galaxy--including the Empire. In retrospect, Imperial invasion of Corellia was not merely inevitable--it was a necessary step toward the Republic's defeat. The largest and most prosperous business entities occupy a series of massive towers nicknamed the "Incorporation Islands." Most of the sector is wholly owned and controlled by different galaxy-spanning enterprises, and many have responded with hostility to the Imperial takeover. Some of the fiercest fighting on Corellia has been against highly-paid corporate security forces and their armies of droids. Corellian-manufactured high-tech goods--particularly starships and starship parts--are considered some of the finest in the galaxy. The planet's Labor Valley sector is home to dozens of interconnected industrial factories producing everything from raw durasteel to hyperdrives and thermal detonators. Millions of middle-class Corellians found their livelihoods in Labor Valley before war devastated the area. Republic and Imperial forces are battling for control of key factories and destroying anything they can't hold for themselves. Vital plants lay in ruins and a massive fire rages out of control at a major fuel refinery. What was once an industrial paradise has become an apocalyptic inferno. Corellia's citizens can only look on in horror as everything they've built is methodically obliterated. Whereas the Republic Foundation Museum in the Government District is considered a scholarly resource of priceless antiquities, Axial Park's Museum Republica was designed with tourists in mind. Combining the refined presentation of more traditional museums with display exhibits best described as carnival-like, the Museum Republica tries to offer something for everyone. Before the Imperial Guard raided the museum and transformed it into a base of operations, the museum displayed many items of disputed provenance: a cybernetic lower jaw allegedly belonging to Darth Malak, a pair of boots worn by the fabled Jedi Cay Qel-Droma and a deactivated G0-T0 infrastructure planning droid said to have been recovered from the Malachor Five asteroid field. One of the largest archival resources on Corellia is the Republic Foundation Museum, a monument to the multi-millennial history of the Empire's greatest enemy. Priceless antiquities and invaluable records rest within the museum's vault-like walls, protected by high-security energy shields--now augmented to withstand Imperial bombardments. Morale is high among the rebel forces clustered inside, despite a life under siege; many of the soldiers and Jedi find the surroundings inspirational. Once the Empire has crushed all resistance on Corellia, its first order of business will be to storm the Republic Foundation Museum and remove all of its wonders. Moff Tarandon has proposed that the museum be converted to a celebration of Imperial culture, while Diplomatic Service officials hope the museum can be used to teach Republic history from a more honest perspective. Other proposals include setting fire to the museum's contents in a public square and broadcasting the destruction across the Empire. One of the most storied Imperial vessels orbiting Corellia is the legendary "Tears of Taris," a modified dreadnought built, in part, from the remains of a Centurion-class battle cruiser from the time of Darth Malak. The Centurion was part of the fleet that bombarded the Republic world of Taris over three hundred years ago; it changed hands many times over the centuries that followed, but it has always served the Sith in one form or another. When Darth Charnus became aware of the Centurion, he ordered it disassembled and its key elements integrated into his new dreadnought--an act to honor the vessel that had survived for so long. Now, it is a formidable ship built to besiege planets and deploy troops. Corellia is its greatest challenge yet. One of the founding worlds of the Galactic Republic, Corellia nonetheless prides itself on its independence. Some of the finest starships in the galaxy are made on Corellia, along with their daring pilots--men and women looking to explore, to trade or just stay ahead of the law. The cities, like the people, are distinctly Corellian, incorporating the natural landscape into their design despite a heavy manufacturing base. The Corellian government recently agreed to turn over power to the Sith Empire. This has resulted in riots in the streets and open revolution despite Imperial claims of legitimacy, and the capital of Coronet City has become a battlefield.